Followers of the Dark Knight/Batman might think of "Bruce Wayne," but other associations come to mind when the name "Wayne" is heard. Within the "weird news" field, it has been a well-known truism that if a criminal has a middle name of "Wayne," no one in the newsroom is surprised he is being charged with murder. The examples are multiple. 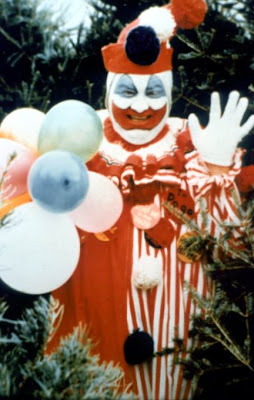 The most famous case, of course, is John Wayne Gacy. It only occurred to me in the early 1990s that "Wayne" was a popular middle name among a few of the most heinous murderers of our time, e.g., the clown John Wayne Gacy (who killed almost three dozen boys and young men in the late 1970s and buried most of them beneath the floorboards of his Des Plaines, Ill., home) and Elmer Wayne Henley (sentenced to six consecutive life terms in 1974 in Houston for his role, with ringleader Dean Allen Corll, in the murders of 27 young men). I began to publish periodic lists in 1996, and soon readers made sure I never missed a one that made the news. Source, plus his impressively long list of names. Now, today, Mother's Day, May 12, 2013, there is a breaking story out of Waynesville, Indiana, in Bartholomew County. Police are reporting that Saturday night, four dead bodies were discovered in a residence there. The three deceased men (in the front room) and one dead woman (in the bedroom) had been shot. The victims have been identified as 53-year-old Katherine Burton, 39-year-old Thomas Smith, 41-year-old Aaron Cross and 41-year old Shawn Burton. No suspect is in custody. Authorities identified the others who were killed as Katheryn Burton's longtime boyfriend, 39-year-old Thomas Smith, who also lived at the home, and two 41-year-old Columbus men, Aaron Cross and Shawn Burton. The coroner said the Columbus men were friends of the couple, but were not related to them. Waynesville is a few miles south of Columbus. Source. Wayne is an Old English name that means "wagon-wright," "wagon builder," and/or "wagon-driver." Bartholomew was one of the 12 apostles, sometimes called Nathanael (Mark 3:18). It is a male name, from the Hebrew, meaning "son of Talmai." Bartholomew County was formed on February 12, 1821 and was named for Lt. Col. Joseph Bartholomew, wounded at the Battle of Tippecanoe. Bartholomew joined the Revolutionary War at the age of 10, and he served as a scout for General “Mad” Anthony Wayne. Bartholomew married Christiana Pickenpaugh in 1788. His daughter Martha and several of his grandchildren were some of the earliest converts to Mormonism and several were baptized into the Church of Jesus Christ of Latter-day Saints. Of course, it is only a coincidence to note that the town directly south of Waynesville, Indiana, only 11 miles away, is Seymour, Indiana. Fifty-seven miles west of Seymour is Aurora, Indiana. "Wayne" -- In light (so to speak) of the previous post about the year of Lear (things going away, fading) I don't think it hurts to observe that "Wayne" also is a kind of homonym (a homophone) for the word "wane" which means "1) to decrease in size, extent, or degree, dwindle, as, a: to diminish in phase or intensity — used chiefly of the moon; b: to become less brilliant or powerful, dim; c: to flow out, ebb; 2) to fall gradually from power, prosperity, or influence."